As at least one observant Twitter user has noticed, I’m testing out a new Twitter client. 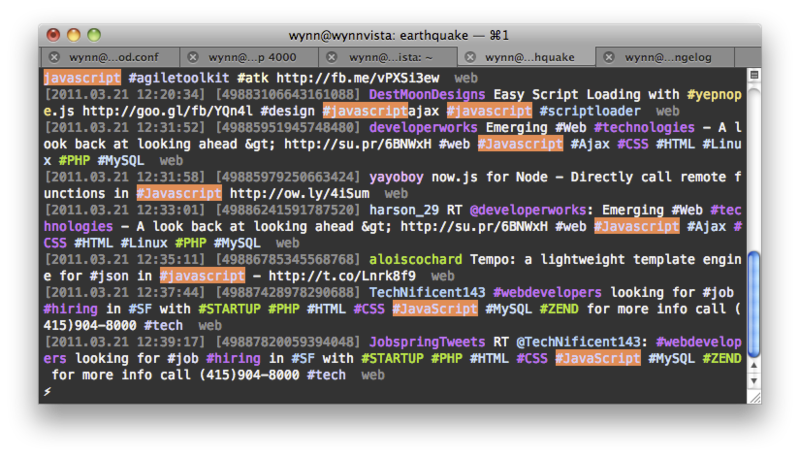 Earthquake, from jugyo (十行), is a Command Line Interface Twitter client similar to Console Tweet but with support for Twitter’s Streaming API. As Mathias Meyer was nice to point out, you’ll want to type :exit not exit to leave the application. Be sure and check the README for advanced usage and color customization. Intrigued by my exit tweet, Changelog alum Tim Caswell wants to rebuild Earthquake in Node.js and offered a fine start in under thirty seconds.